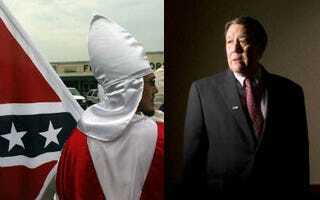 Hate Groups: Preparing for an Obama Win? (The Root) — When retired Army Col. Lawrence Wilkerson denounced the Republican Party as "full of racists" in a recent interview, he ignited a firestorm. Though the comments were not the first time the Republican Party had been accused of being the chosen party for those harboring racist tendencies, it did mark one of the first times a high-profile Republican made such a stinging accusation. Wilkerson made the remarks while defending his former boss and fellow Republican, former Secretary of State Colin Powell. Powell's endorsement of Democratic President Barack Obama led some Republicans, among them Romney campaign surrogate John Sununu, to speculate that Powell's presidential choice was motivated by race. While these developments led to fresh allegations that the Republican Party is the party of racists, there has been little coverage of the activity of actual, self-identified racists this election cycle, specifically those within the white supremacist movement. Founded by Gordon Baum in 1985, the CCC is considered by many to be the ideological heir apparent to the White Citizens Council, a group that became notorious at the height of the civil rights movement for being the upper-class alternative to the Ku Klux Klan. Instead of burning crosses on lawns, the White Citizens Council employed tactics such as printing the names of NAACP members in newspapers, as well as paying the legal bills for Byron De La Beckwith, who assassinated NAACP worker Medgar Evers. Baum, a former organizer for the White Citizens Council, launched the CCC by relying on old White Citizens Council membership lists. Among the Council's core principles as of 2012: opposition to illegal immigration, homosexuality and opposing "all efforts to mix the races of mankind, to promote nonwhite races over the European-American people through so-called 'affirmative action' and similar measures, to destroy or denigrate the European-American heritage, including the heritage of the Southern people, and to force the integration of the races." Speaking to The Root, Baum said that the Council of Conservative Citizens does not consider itself a political group. "Normally we just try to get our people out to vote. We don't try to dictate to them who to vote for." The Council has a highly publicized and controversial political history. In 1998 the Washington Post revealed that Republican Sen. Trent Lott and other conservative Southern politicians had spoken at CCC events. One of Lott's relatives claimed Lott had even been a member. Current Mississippi Sen. Roger Wicker is alleged to have attended a group event in 2000. After public scrutiny most politicians renounced the organization's openly racist ideology. But according to Baum, while publicly politicians no longer embrace the group, privately plenty maintain ties to it. "We have political speakers all the time at the local level and national," including federal officials, he claimed. When asked for specific names, he declined, saying that after the unflattering coverage Lott and others received for ties to the group he will never divulge the name of political supporters without explicit approval from them. When asked if there is a particular political affiliation common among the group's political supporters Baum replied, "Most of them are probably Republicans. Not all, but most, because they tend to be more conservative." Though Baum declined to discuss current membership numbers, he did say that the group, which once had a roster of 15,000 members, currently has members "in every state of the union and 12 foreign countries." Baum stressed that while the group doesn't endorse candidates, it does strive to keep members politically informed and engaged through its newsletter and conducting polls. Its most recent poll on the presidential election was conducted this summer, although he said the results would not be made public until after the election. He did, however, say the winner "was overwhelmingly Romney." The results of the organization's poll may not have been particularly surprising, but Baum's election prediction was. After decrying President Obama as "the worst president of my lifetime," Baum said, "I hope you got a good job because we got Obama four more years." According to Potok, Baum is not alone in this sense of resignation within the white supremacist movement. Potok said that "there is surprising little activity from Klan, etc." The number of white supremacist groups ballooned from 600 in 2000 to more than 1,000 last year, but his sense is that "What we're seeing is a kind of meltdown as they contemplate four more years under the hated black president." Potok recalled that as soon as President Obama first received the Democratic Party nomination, there was a skinhead plot to murder him, and other white separatists have been arrested for similar plots since his election. But while the activity of some hate groups may appear to have mellowed in this election cycle, their rhetoric has not. In a recent TV segment for Nightline, Steven Howard, a grand wizard for the Ku Klux Klan, attempted to rev up his fellow Klansmen by chanting, "Barack Obama does not care about us, he does not care about America." He later said, matter-of-factly, that if President Obama is re-elected there will be a race war, and white Americans will be in danger of being placed in concentration camps. We do well to be disgusted and outraged that he would do that at one time, but at some point, we have to get real: He has a beautiful White family now, but that's not even the real point. The biggest issue is Obama and the supreme court and other things Obama's done/will do if given half a chance; and then there's the disgrace of having a black man in the White house … As I've said before regarding Romney/Ryan camp: they may be useless to us, but Obama is a positive and determined threat … Obama will stack the Supreme Court with his anti-White cronies. Look what he has already done: A hispanic who hates Whites, and a jew who is a raving liberal. Once again, the right-wing is totally unprepared to field a viable pro-White or even mainstream right-wing candidate to oppose the two-party candidates. Are we supposed to allow the mulatto Obama to stay in the White House and thereby encourage millions of White women to think that 'Black men are OK and race-mixing is OK'? I'd at least like to win the consolation prize and vote the Black monkey out of the White House so that he's branded a one-term-president and quota-hire failure. Hopefully, race-mixing will drop in popularity as a result. It is easy to dismiss inflammatory language as disconcerting but essentially harmless, but the connection between racist rhetoric and actual violence cannot be dismissed entirely. After hailing Steven Bowers, the late Klansman credited with masterminding the murders of three civil rights workers as "the greatest Klansmen that ever lived," Klansman Steven Howard told Nightline's Cynthia McFadden he "doesn't endorse murder." But when pressed, he declined to disavow violence altogether. He and his fellow Klansmen refer to a looming race war that will be expedited by President Obama's re-election as "the storm." According to Howard, the only way to avoid such conflict is to divide up the United States of America by race. For anyone unwilling to cooperate, particularly Jews and blacks unwilling to relocate from the South, Howard says, "If they will not peacefully then the only way is through violence." This may be just heated rhetoric, but new data indicates that an increasing appetite for race-based violence is on the rise. A report just released by the Los Angeles County Commission on Human Relations (LACCHR) found that hate crimes in that county "reflecting white supremacist ideology rose from being 18 to 21 percent of all hate crimes," between 2010 and 2011 (although noting that hates crimes overall there were at their lowest rate in 22 years). The Southern Poverty Law Center has also observed that violent rhetoric spurred by Obama's potential re-election has become more common among what are referred to as "Patriot" hate groups. These groups hate the black president, fear his re-election but also have strong antigovernment feelings. "They're looking at four more years under a very hated black president — hated by them. So, we're seeing signs of real anger over that. People saying we're at war already, saying go out and buy AK-47s and hollow-point bullets, get tools to derail trains," Mark Potok told the Raw Story earlier this year. These developments raise the disturbing possibility that while hate groups appear to be doing less this election cycle, they could actually be preparing to do more should the president be re-elected. If what Potok observed is true, then it's possible that whatever anger these groups feel toward President Obama is small compared to the rage they may feel toward candidates in both parties four years from now. Republicans such as Jeb Bush have predicted that Latinos will soon decide presidential elections, which means both major party nominees are likely to temper language on issues like immigration to woo Latino voters. When this happens, white supremacists may find themselves without any viable mainstream political options. But for now, they are hoping for their best-case scenario and preparing for what they view as the worst: four more years of Barack Obama in the White House.